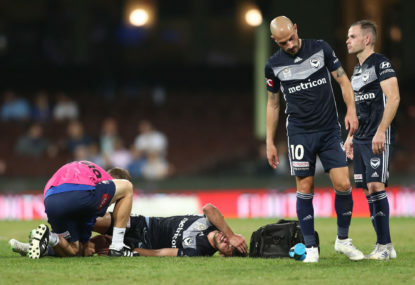 The worst thing about Terry Antonis suffering a knee injury at the Sydney Cricket Ground on Saturday night is simply the fact it was so predictable. Who is going to be broadcasting the A-League in five years’ time? 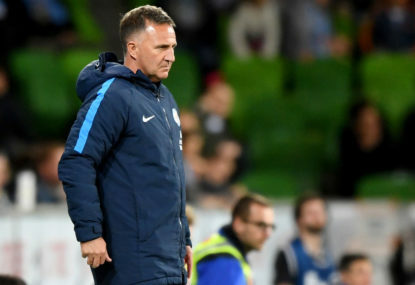 Melbourne Victory’s 2-0 win over Perth Glory on Saturday night means there’s still plenty to play for over the remaining four rounds of the season. When are we going to start talking about the football again? Do you ever get the feeling football administrators would love the sport a whole lot more if only they didn’t have to put up with so many football games? 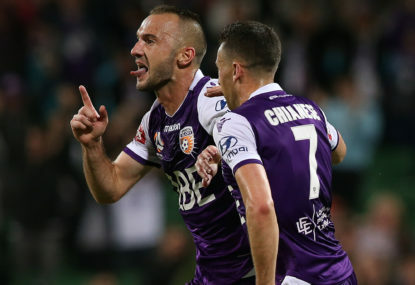 Who is paying for promotion and relegation in the A-League? You know it’s been a successful writers’ festival when it generates a “Clarification of FFA Chairman comments” media release late on a Sunday afternoon. When did football become so difficult to like? The news that Australia will support Sheikh Salman’s bid for re-election as Asian Football Confederation president was both predictable and utterly depressing. 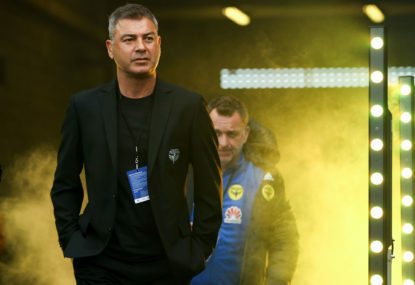 Mark Rudan said it better than anyone when he told reporters he didn’t want to talk about the football following Wellington’s 3-1 win over Western Sydney. 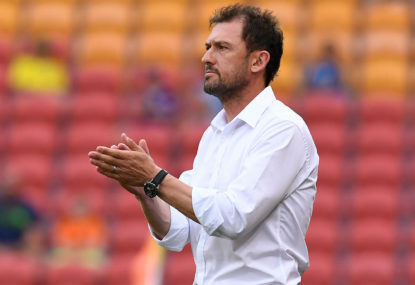 Most A-League players can't compete in Asia. Why shoot the messenger? 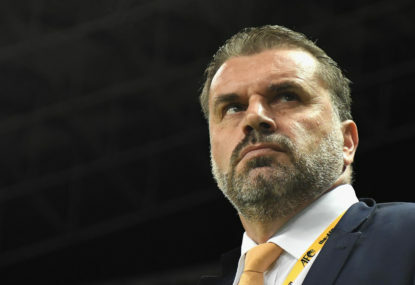 The man most qualified to talk about what Australia must do to compete in Asian football is now persona non grata with many observers of the Australian game. If the citizens of Gosford wanted to save their football club they would fill every available seat for the Mariners’ next home game against Adelaide on March 31. 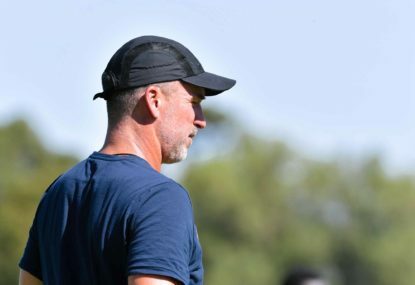 In what other country would the coach of a club with one win in nine games watch his side blow a two-goal lead and still not be in danger of losing his job? 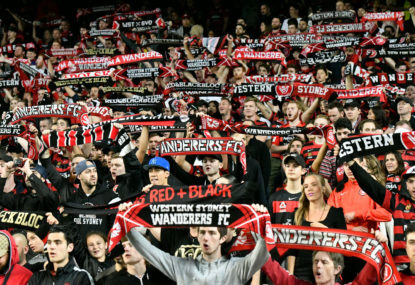 The new Western Sydney Stadium will be a game-changer for the A-League, even if the Wanderers have a bit of work to do between now and next season to fill it. 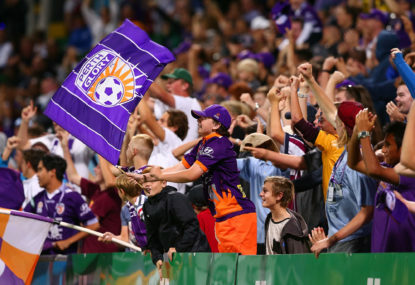 Have the A-League's ratings tanked because people no longer watch TV? The NRL is about to experience what the A-League has been going through all season, namely a sizeable decrease in the number of fans watching it on TV. Japan is the template, but does our football culture allow us to follow it? 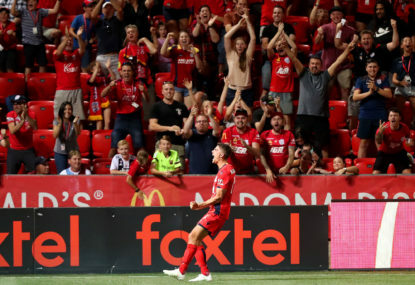 One of the world’s most entertaining leagues kicks off tonight, but Australian fans will still react with astonishment whenever they see one of its teams in action. 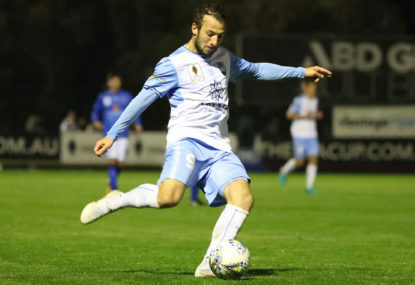 Sydney FC’s 1-1 draw with the Central Coast Mariners at Leichhardt Oval was another case of the Sky Blues doing everything right off the pitch and not a lot right on it. 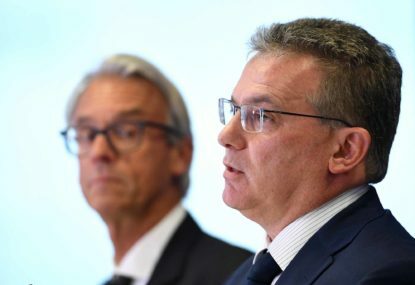 Perhaps the worst thing about the ongoing Matildas crisis is the fact that Football Federation Australia once again seemed to think that nobody would care. So does the same sentiment extend to the 77,000 spectators who turned up to watch the Socceroos beat Honduras at ANZ Stadium? Of course not. Because it’s just a confected cultural cringe. As I said elsewhere, you simply can’t play a game guaranteed to sell 50,000+ tickets at a 20,000-capacity stadium. 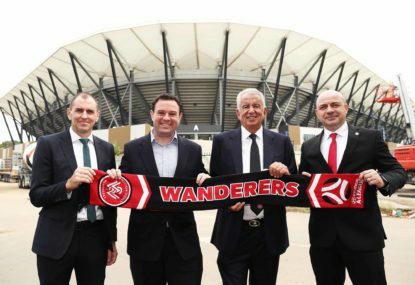 Do you get the feeling, ScottyQ, that the New South Wales government preferred the Parramatta Eels to open the new stadium over the Wanderers? Yes, but when I literally wrote a column entitled “Western Sydney Stadium is the feel-good story the A-League needs,” your comments were unsurprisingly nowhere to be seen. Which would effectively make you the problem, Marcel, not me. 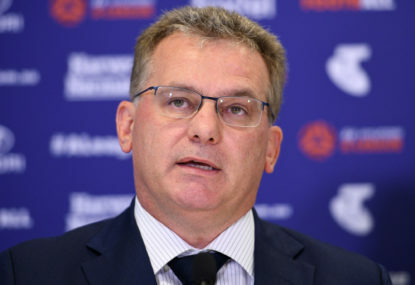 Are you happy with the decision to play the final two home games of the season at ANZ Stadium, josh, or would you have preferred them to be played at Bankwest Stadium? It’s a fair question. 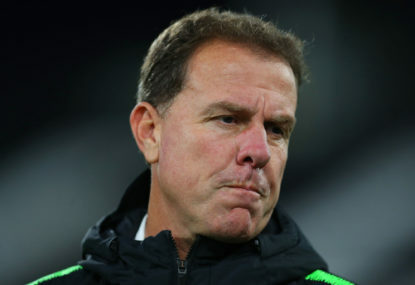 I think the tendency from many sections of Australian football has been to project an answer to any specific question out of thin air, then try and build a case around it. And I feel like that’s a bit of what we’re seeing with the debate around promotion and relegation right now. That said, this notion of Australian exceptionalism isn’t working. 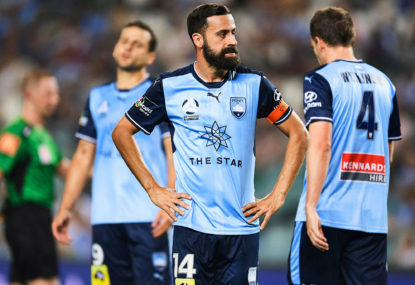 The A-League has gone backwards, our national teams have regressed and top tier of the game is teetering on the brink. Will promotion and relegation help that? Not in the short term. 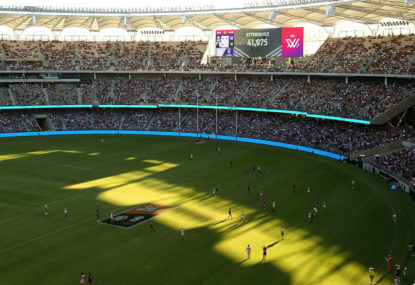 Does Australian football need it? Yes. I think the truth of how we get to all these critical junctures in the meantime is what certain parties will find unpalatable. Can football fans handle the truth? The joke obviously being that SIPG scored shortly after I tweeted about Sydney FC, but made redundant as soon as the referee blew the full-time whistle about two seconds after I hit submit. But anyway, I’m flattered so many are following my social media utterances and I just know Josh and I are going to have fun with Friday’s column! Well the second one was an attempt at a reverse jinx… but I was so slow typing it out the ref blew the full-time whistle! How’s The Crowd only tipping two from five last week? I’ll have to ask Paul if he’s keen to split the celebratory bottle of champers. The only aim of these articles is to discuss the A-League. That’s it. Hard to see Broich coming back now. He’s the best of the Bundesliga’s ex-player colour commentators by a country mile. I used to work for them. Don’t get me started! I wasn’t talking about on here, to be honest, but I’ll tell you why I made that comment. For years now I’ve seen posters on forums like reddit and Twitter and the old FourFourTwo forum complain about a lack of coverage in the media. They’ll bang on endlessly about how they have to turn several pages in to find A-League coverage in the newspaper… then freely admit they never buy the newspaper anyway and wouldn’t dream of doing so. Then when you present them with the opportunity to participate in an online discussion, like The Roar has done for years, they steadfastly ignore it. All they want to do is complain. So be it, I suppose, but it’s certainly been noticed. Think the last time I tipped them they lost 5-1 to the Jets! You might be in the minority there, RF, as I got a phone call on the back of this column from someone close to the situation to talk me through many of the pros and cons of promotion and relegation in the A-League. Let’s just say there’s not a whole lot of alignment among the many stakeholders in the game. I think there’s a separate discussion to be had about where World Cup finals participants actually come from. 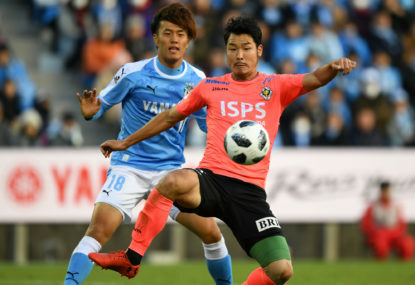 Historically speaking, continents like Africa and Asia have long been underrepresented and as a fan of Asian football in general, that’s something I’ve long been conscious of. My annoyance – if that’s the right word for it – stems from the fact that Infantino and FIFA are clearly just making it up as they go along. That might be good enough for one of my Roar columns, but is this really how the most popular sport on the planet should be run? Hah, I still think Ronaldo is an exceptional footballer. Just not as good as Messi. I still think Messi is a much better player than Ronaldo too. 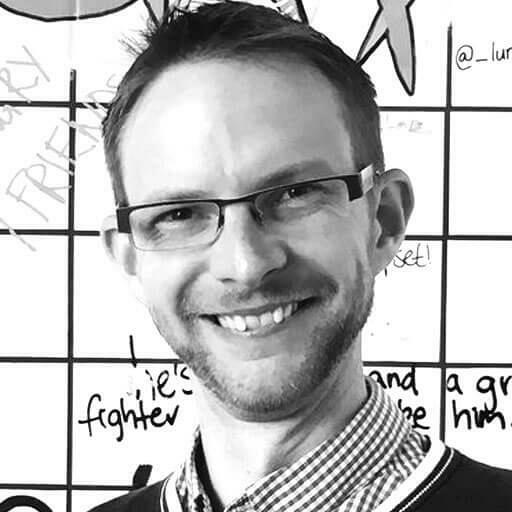 No drama Onside – I appreciate the comments.